Fans of the well-loved characters Miggy Montenegro (John Lloyd Cruz) and Laida Magtalas (Sarah Geronimo) will not wait for long anymore as Star Cinema and Viva Films, Inc. finally have the much-awaited conclusion to the love story we all followed which will unfold on March 31, 2013. "It Takes A Man and A Woman" is the third installment to the most successful franchise love story ever made in the history of Philippine movies. It stars John Lloyd Cruz and Sarah Geronimo and directed by the box office director, Ms. Cathy Garcia-Molina. 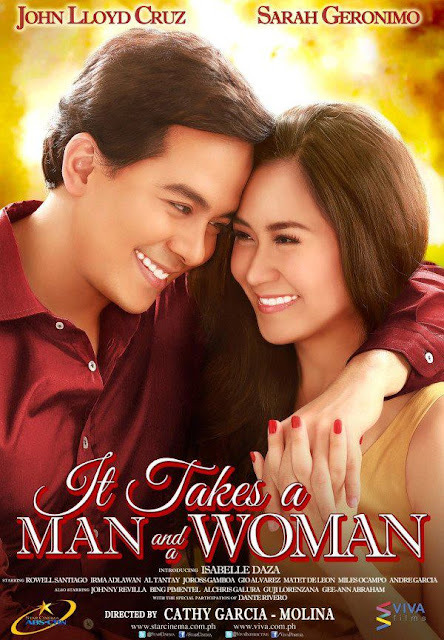 Sarah Geronimo sings the official soundtrack of the movie "It Takes A Man and A Woman". Below is the official music video to the music of the movie with lyrics. Enjoy!